There were no automatic lowering mechanisms or whatever. No rent-a-cops to stand guard. Back in the day, the only thing to keep you from tearing down the goalposts after a win were the fists of rival fans. But for Auburn students in the 1930s and 1940s, black eyes were a small price to pay for shaming an undefeated Georgia team. And that’s what it was back then—a shaming, purely directed at the losers. You didn’t tear down your own goalposts. Sure, you might paint the town orange and blue, but you didn’t damage your own team’s facilities, at least not on purpose. That was just weird. Goalposts were tokens taken from victims. 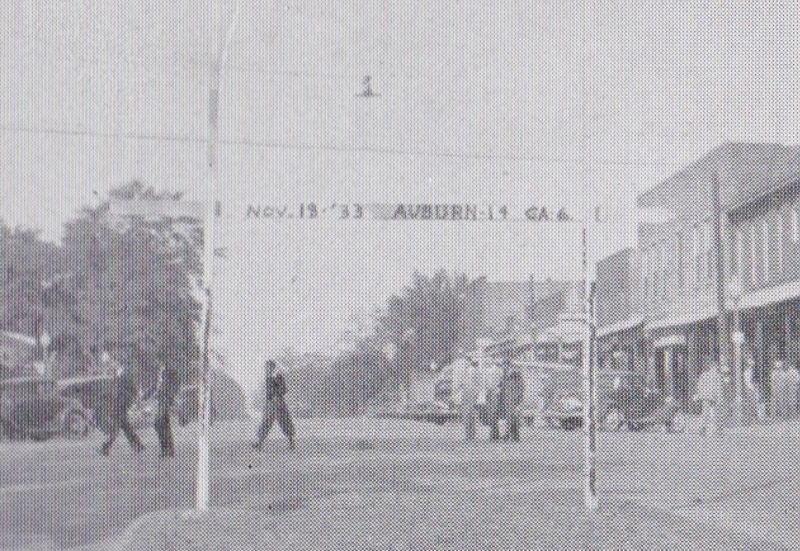 And the first real time Auburn partook in the barbaric practice was against Georgia. 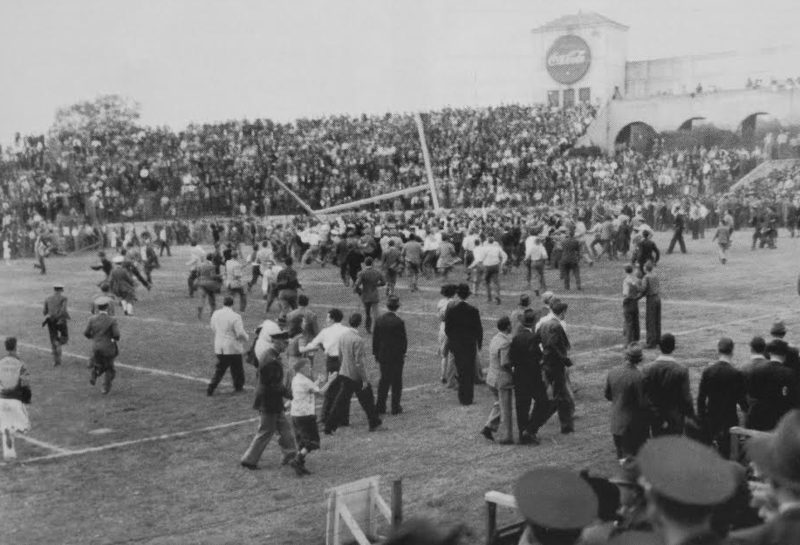 No, not the 1942 game, though that’s the toppling you hear about the most (if you do hear about it), in part because there’s an actual photo of the fall, but also because of the magnitude of the upset. That was the best Georgia squad in forever, a “Dream Team” heralded the headlines. They were No. 1 by a mile and just coasting to California en route to a national championship. I’m pretty sure they already had a Rose Bowl invitation. The bags were packed, and one of those bags belonged to Frank Sinkwich, that season’s eventual Heisman Trophy winner. Another belonged to Charley Trippi, another All-American who beat out Sinkwich for MVP honors in Georgia’s 9-0 Rose Bowl win over UCLA. There was no way a 4-4-1 Auburn team that had been shutout by Florida, the same team the Bulldogs shutout 75-0, was going to win the game. Final score: Auburn 27—Georgia 13. They weren’t going to keep them from tearing down the goal posts at Memorial Stadium and somehow carting them back to Auburn and having the Auburn players autograph it and putting them on display at a downtown barbershop that night. 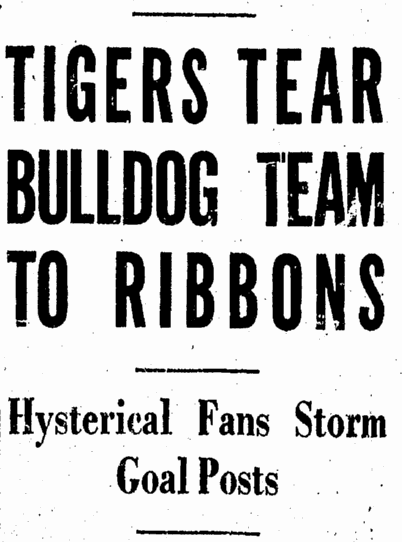 But the first major, and mostly-forgotten post-napping actually went down ten Georgia games earlier, Nov. 18, 1933. A 4-3 Auburn team, Coach Chet Wynne’s last, vs. an 8-0 Georgia team that had just beaten Yale in New Haven. Final score: Auburn 14—Georgia 6. The Plainsman’s description was a little more Keelerful. The constant uproar that had preceded the zero hour hushed for an instant as though in anticipation, and in that breathless instant the whistle sounded shrill and clear. Over the top swarmed the lads in the blue uniform and forward they surged, determined to carry by assault the fortress that had been breached but still resisted. Missiles large and small spun through the air and here and there a man dropped and lay still. The fiendish uproar had broken out in renewed fury and as though in answer, a similar burst of hellish sound erupted from the other side, while down the opposing slope poured another mass of men with determination written on their faces. Clashing at their very goal the two forces rocked in combat, neither seeming to gain the advantage. Reeling figures staggered from the melee and sought an open space to lay their wounded frames. The intensity of the battle increased till it seemed as if the very world would dissolve in chaos and then the blue surged on, over-flowing their goal, and the end of the battle was here. Auburn had taken the Georgia goal posts. But what makes 1933 so special is what the lads in the blue uniforms appear to have done with with the Bulldog bones after they somehow got them home. I mean, a private business displaying a trophy like that is one thing. But there are all these references in the Plainsman in the first few issues following the game that make it seem like the goalposts were actually planted for at least a week up at Toomer’s Corner, maybe longer. Related: The Deep South’s Miscounted Rivalry: Auburn’s 1899 win over Georgia was somehow erased from the record books.